Season Finale and a new era of #Droughtlander begins. NOOOOOOOOOOOO!!!!!! Even though we’ve read the books and know what to expect, the show still keeps us on our toes. Given the title, you can tell this episode will focus more on the men of the series, than the women and that’s ok. But who is the “man of worth”? Well, a large vote goes to Young Ian. 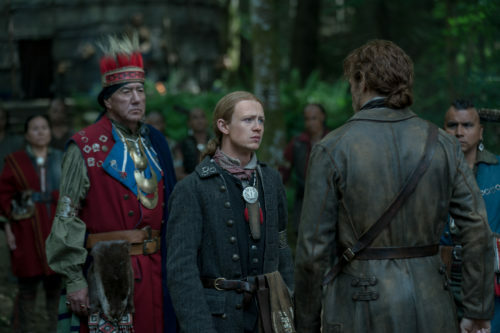 John Bell has been a favorite of ours, and I’d say Outlander fans everywhere, but this episode he really shined. From the moment Young Ian decides to join the Mohawk, you see all the uncertainty and awkwardness that Ian displays at times disappear and the man he is becoming starts to shine through. It’s like watching a butterfly emerge from the cocoon. The scenes between him and Sam Heughan are just achingly beautiful. Everyone did a great job, but those two just killed. Claire is sad as well, but Jamie…we teared up while Ian and Jamie said goodbye, because how can you not? A vote can definitely go to Murtagh, because he’s a studly silver fox and we all saw him hooking up with Jocasta coming from a mile away, but still, this will have an interesting impact on the story. In the books, Murtagh is dead at this point, so to not only have him alive but entering into a relationship with Jocasta is an interesting twist and one we’re quite intrigued by. In the books, Duncan Innes was a former prisoner at Ardsmuir with Jamie who follows him to the colonies and winds up with Jocasta, but he’s not a Regulator so while there are definitely shades of his story in Murtagh’s plotline, there is also quite a bit that is very different. We’re looking forward to seeing how the writers will weave this into the narrative of the books in the upcoming seasons. This could have a lot of interesting places to go (after all Jamie has been ordered to hunt down the Regulator leader and kill him), or the writers and producers could have just backed themselves into a corner. Of course, Jamie gets a vote because he’s Jamie and the King of Men. But let’s talk about some of the difficult topics the show is still trying to tackle. The opening was a bit of a conundrum in that we couldn’t figure out how it really fit into the show until the story about the skull and ghost Claire saw earlier in the season started to come out. Turns out the skull she found belonged to a man the Mohawk called Otter Tooth, and like the Geillis, had come from Claire’s ‘present’ to the past in order to try and undo a massive wrong. Geillis wanted to save the Scots from years of torment after the failure at Culloden, and Otter Tooth wants to save his ancestors from the atrocities that the European (and let’s just be honest – primarily white) settlers visit upon all the native tribes. Like the slavery issue, it will be interesting to see how these very dark and unsavory truths about America’s history unfold and are handled on the show. So far they feel like an attempt has been made but also glossed over a bit. Understandably, we get that it would be impossible to tackle issues as weighty as these without that being the main focus of the show, but we still have to ask is there more they can do? So what did all of you think about the finale? Do you feel satisfied with where it ended? Do you feel like something was missing? Do you already have plans for Droughtlander? We’ll be biding our time stalking following the actors and show on social media. Here’s a moment from earlier in the season between Young Ian and Jamie because…ALL THE FEELZ! Book Beat quick takes on new books with Wonder Woman, BB-8 and ladies who persisted! NYCC Recap: Back in Time with Back to the Future! Get your own Pepsi Perfect!